Develop focus, concentration, and critical thinking. Learn chess from Columbus' premier coach -- Chuck Diebert. 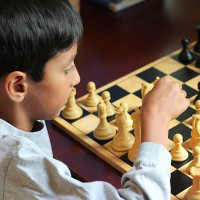 Chess has been proven to enhance creativity, academic achievement in math and reading, self-esteem and a host of other qualities that every parent and teacher desires. National Life Master Chuck Diebert has lead Math Plus Academy's weekly chess club to win numerous individual and team trophies at competitions throughout Ohio. This camp accommodates all skills levels from beginner to advanced. Students will be grouped by ability within the camp.